It's crunch time again for Mario Draghi. The president of the European Central Bank, whose 2012 pledge to save the euro helped Europe crawl out of its debt crisis, is being called upon to perform another rescue mission. With prices falling for the first time since the Great Recession, investors are now betting heavily that the ECB will start printing money to buy government bonds on a huge scale. The Fed-style program of quantitative easing (QE) would be aimed at preventing a deflationary spiral that could spark a new crisis. "We see a very high probability that the ECB will scale up its asset purchases shortly, probably on January 22, with at least a 65% probability that the new purchases will include sovereign bonds," wrote Berenberg chief economist Holger Schmieding in a note. 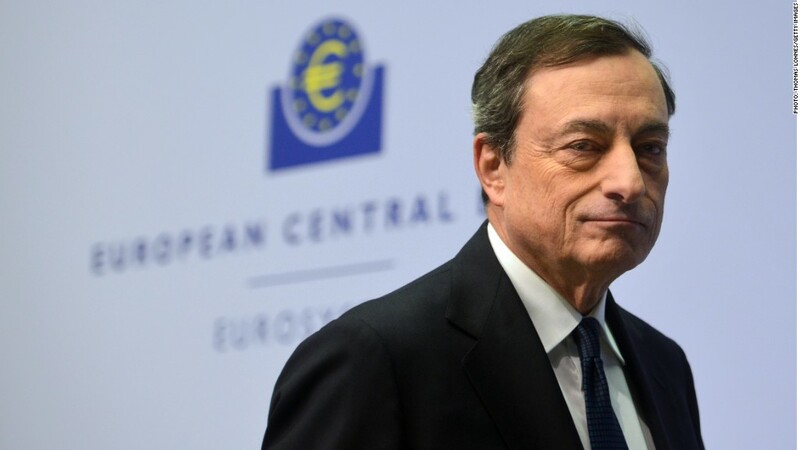 The president of the European Central Bank, Mario Draghi, must decide whether to launch a Fed-style stimulus program later this month. Unlike other central banks, the ECB has only one policy goal and that is to keep prices stable. It defines price stability as annual inflation of just below 2%. The last time it was anywhere near that level was two years ago. There's no chance of it returning to target before 2017, according to the bank's own forecasts. Eurozone consumer prices fell 0.2% in December, the weakest figure since September 2009. As oil prices continue to tumble, there could be worse to come. "We expect another sharp fall in [annual consumer price] inflation in January, by around -0.5%," forecast Gizem Kara, senior European economist at BNP Paribas. "Inflation will then hover slightly below zero for most of 2015." The danger for Europe is that falling prices -- or zero inflation -- stifle the region's already feeble economic growth. Consumers and businesses may choose to save rather than spend if they think prices will fall further in the future. The eurozone emerged from recession in the middle of 2013 but has been stuck in first gear ever since. Business confidence is recovering from the freeze in relations with Russia over Ukraine, but recent indicators suggest 2014 ended on a weak note. The quarterly rate of growth may have slowed to just 0.1% in the last three months of the year, according to surveys. And the number of unemployed in the eurozone rose for a third month running in November, the first time that has happened since early 2013. A new recession is the last thing Europe needs. It would make it even harder for countries such as Italy to service their enormous debts and could inflame a backlash against austerity that already threatens to topple Greece's government. 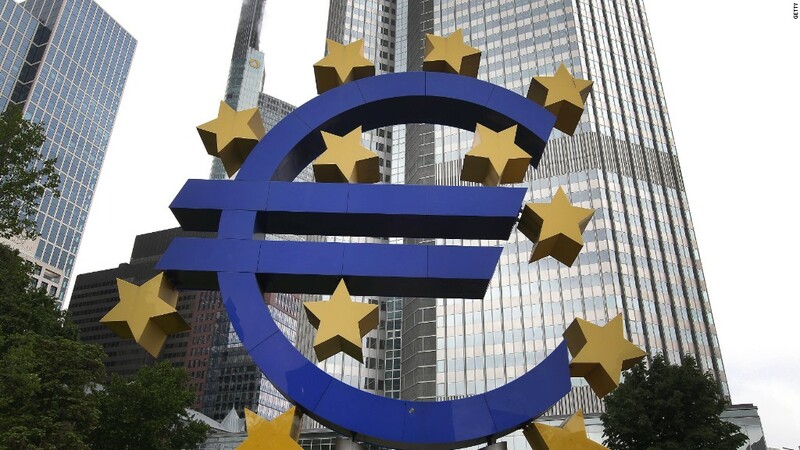 The ECB has cut interest rates as low as they can go, and launched limited asset purchases. Buying government bonds is the last big weapon in its arsenal. Draghi has held back, apparently because he has so far been unable to win the support of enough member of the ECB's governing council. Opposition is particularly pronounced in Germany, where critics argue QE would be ineffective, let governments off the hook by reducing the pressure for economic reform, and may even be illegal. If Draghi holds fire again on January 22, it may only be because he wants to keep something in reserve should Greek elections three days later deliver another blow to the eurozone. Leading the opinion polls in Greece is a party that has pledged to cancel a big chunk of the country's debt and negotiate new terms on its 240 billion euro bailout by the EU and IMF. That could lead to an impasse that may ultimately force Greece to quit the euro.